Prints the content of your experiment or questionnaire file. You may wish to print a hardcopy of information in your experiment or questionnaire file. To select which columns to print, click Select Columns to View/Print. Check all the columns you want to print. Note that you can start by clicking Select All or Deselect All. 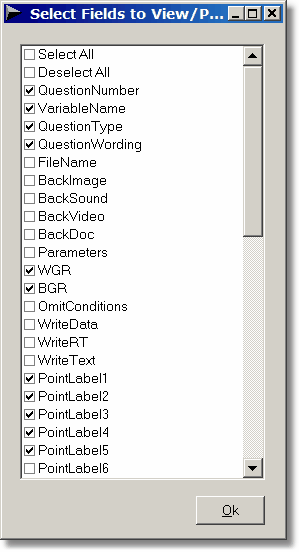 You can manually widen any column if you want more of it displayed when printing. For question wording cells (questionnaire files only), you can expand (print all lines) or collapse (print only the first line) the cells when printing. 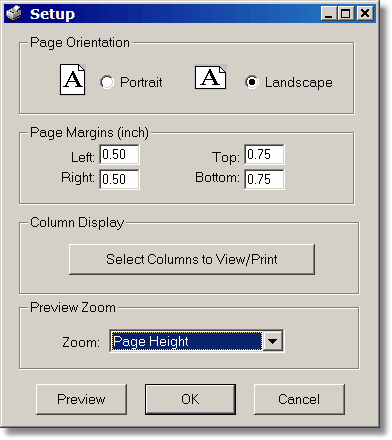 When selecting Print, select Expand All or Collapse All for the Multi-Line Cells option.